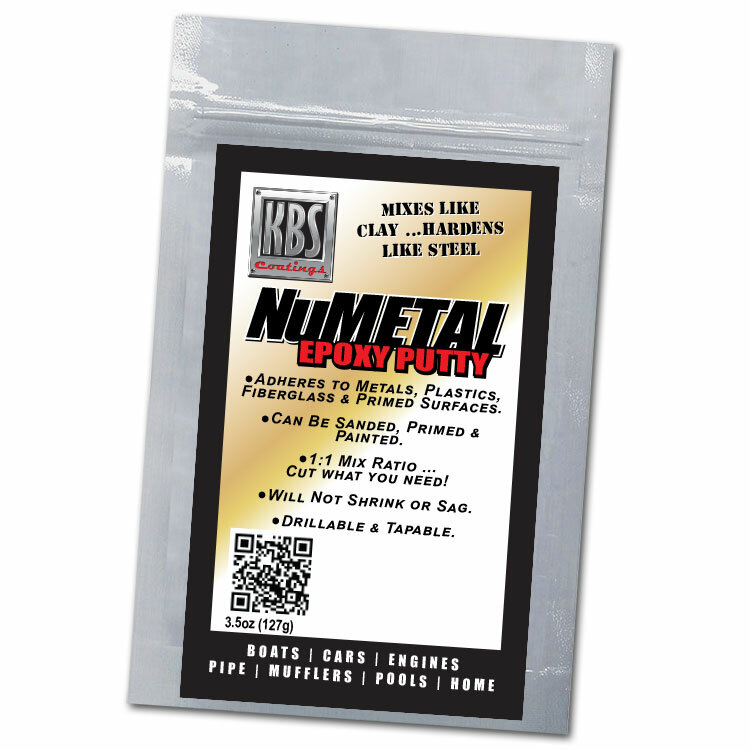 NuMetal Epoxy Putty is an easy-to-use, two-part putty that mixes like clay but hardens like steel! 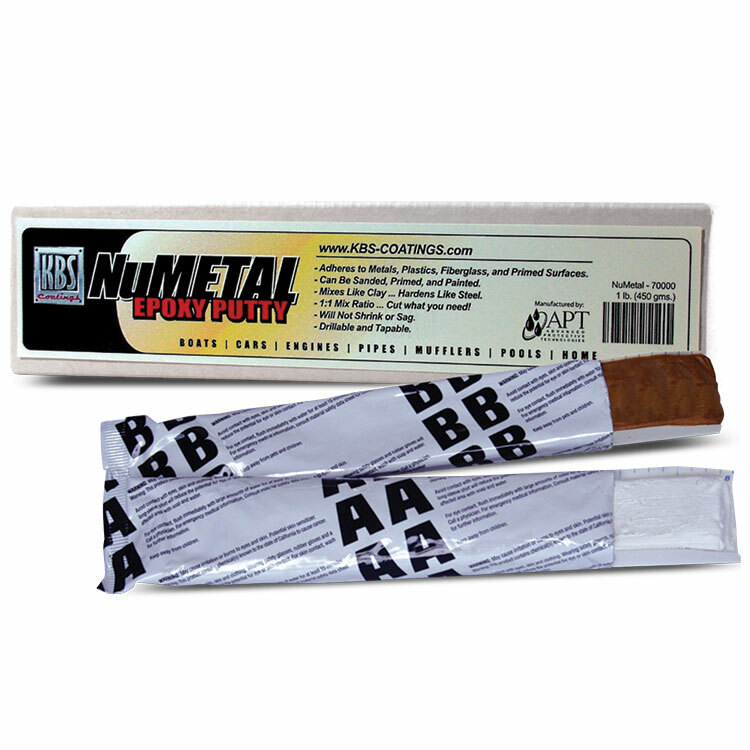 NuMetal bonds, seals, fills, insulates, anchors, caulks and waterproofs. It cures without shrinking or sagging and can be drilled, tapped, sanded, primed and painted. NuMetal will not only stick to damp surfaces, but it will cure underwater! Our Black NuMetal is ideal for automotive applications ... if the surface coating sustains damage, the black epoxy putty beneath remains unseen! Use White NuMetal for marine applications and boat repairs. Satisfaction guaranteed! A demonstration video on how to repair a cracked steering wheel using KBS NuMetal Epoxy Putty. I wish I had this stuff 30 years ago! It's easy to shape and work with. I've learned that if you reinforce a joint and make it look like a 1/4 welding bead and then coat it with one of your products, it looks very professional. Awesome stuff. Will be ordering more in the future. Excellent for minor rust repairs on body panels. Had purchased to restore a cracked steering wheel but was working on 37 Ford body with small rust pin holes in difficult area to replace metal panel. Cleaned rust and applied epoxy. Adhered and dried prefect. A little sanding and pin holes fixed. Much better than bondo. I am working on Old Chevy truck. Had lots of pin hole areas around windshield, cab corners, dash. Cleaned and sanded areas, applied rust blast. then applied rust seal and filled with KBS epoxy putty. Let it harden sanded smooth then did regular body work were needed and primed. If you have thin metal that you don't want o weld in new piece or can't because of location this is the stuff. I used it to repair a rusty truck. It worked just as described. Used around windshield and between rocker and floor pan. Had some rust and small holes. Cleaned area first. Used some Blast to stopped the rust and harden the metal. Sprayed in some rust resistant paint then filled the area with the epoxy and sanded. Worked great. I used this to rebuild a steering wheel on a vintage truck. It was easy to use and it looks great. Followed the how to video which I found on You Tube and it worked very well to fill the cracks on my 66 Volvo 1800S steering wheel. I would not have ever believed that I would find a product to repair rust holes in the trunk of my car. I had been coping forever to repair these holes in my 1973 Pontiac Ventura. Kudos to KBS Coatings for discovering this product. 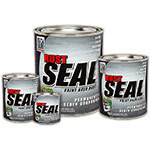 Q: Can Epoxy Putty be applied over Rust Seal? A: Yes, you can apply NuMetal Epoxy Putty over cured RustSeal (24 hours) by scuffing up the RustSeal with 300 grit and then applying the NuMetal Epoxy Putty. Was this answer helpful? 12 of 13 Customer(s) found this Answer helpful.